Brigham headed the vanguard company of 1847, but then after only staying in the valley for a short time, he returned to Winter Quarters and returned the next year with another large company containing most of his family. 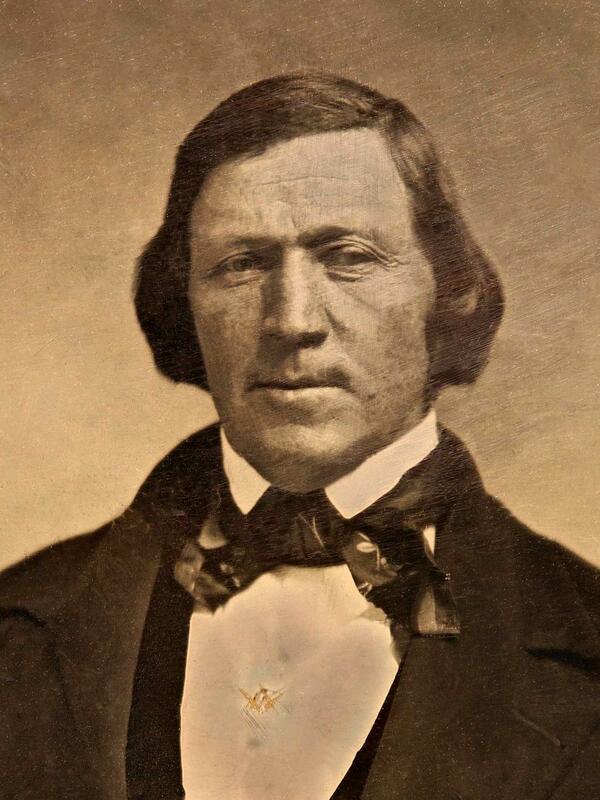 He was the general superintendent and leader of the 1st division in the 1848 company. Bingham, Rojanea Jacobs, "A Brief Life Sketch of My Grandparents: Henry Lyman Hinman and Mary Jane White Hinman," 5-6. Bolton, Curtis E[dwin], Reminiscences, in Salt Lake Stake, Melchizedek Priesthood minutes and records, High Priest Quorum Minute Book, 1848-1860, series 13, vol. 2, 72-73. Cahoon, Margaret Carruth, [Autobiography], in Stella Cahoon Shurtleff and Brent Farrington Cahoon, comp. and ed., Reynolds Cahoon and His Stalwart Sons--Utah Pioneers , 117-18, 121. Call, Anson, Autobiography and journal [ca. 1857-1883]. Hancock, Mosiah, The Mosiah Hancock Journal , 25-26. Heward, John, Autobiography [ca. 1871]. Holbrook, Joseph, Reminiscences [ca. 1860-1871], fd. 1, 145-47. Neff, Elizabeth to Anna Bitner, 8 June 1848, in Musser family, Letters 1847-1849; 1877. Pulsipher, John, Journal and autobiography, in Joel Edward Ricks, Cache Valley Historical Material, reel 4, item 88, 33-46. Stout, Hosea, Reminiscences and journals 1845-1869, vol. 3, 376-79 and vol. 4, 1-41. Westover, Eliza Ann Haven to Lewis Westover, n.d., in Paul Lewis Westover, comp., A Legacy of Faith: A Family Portrait of Lewis and Eliza Westover and Their Parentage , 110.